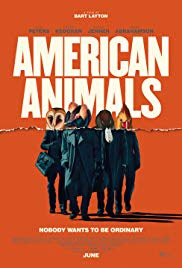 AMERICAN ANIMALS is a beautifully crafted docu-drama about four feckless college students who decided to try to steal some valuable books - including Audobon's Birds of America - from their college library. They don't need the money. One of them even aspires to join the FBI when asked to join the heist. They seem to do it just because... maybe boredom, or the need to feel special in some way? It's all so moronic it hurts my brain. Nonetheless, it makes for a fascinating story because documentary director Bart Layton (THE IMPOSTER) does a fantastic job of contrasting the slippery memories and justifications of the real life protagonists -interviewed on screen - with his docudrama recreation (starring Barry Keoghan - THE KILLING OF A SACRED DEER). For those of you who loved the conflicting memories and elisions of I, TONYA, then this is the film for you. In brilliantly edited and framed scenes Layton takes us from his fictional characters reminiscences of events to the real people, deftly altering the "record" and showing how untrustworthy it actually is. There's also a superb attempt to take us inside the mind of its protagonists, showing us the heist as they imagined it might go, in an Ocean's Eleven style, Dave Grusin scored tour-de-force. And the end of what do we get? Genuine remorse - yes. But also a faintly disturbing feeling that is what kids being raised on a diet of instant gratification will aspire to - life experience and defining moments that are unearned. Frightening, indeed. AMERICAN ANIMALS has a running time of 116 minutes and is rated R. It was released in the USA this summer and is currently on release in the UK.